Of the 17.2 million acres comprising the Navajo Reservation, 1.4 million acres are suitable for irrigation. The Nation’s priority rights to water flowing through its lands are established by federal law. About 40 percent as large as the State of Washington of the Reservation also includes 523,000 acres of Ponderosa Pine and Douglas Fur and 4.5 million acres of Pinon Pine and Juniper. Navajoland is also endowed with vast reserves of coal, uranium, oil, and natural gas. Peabody Coal Company and the Pittsburgh and Midway Coal Company mine 23 million tons per year. Oil wells produced 6.1 million barrels in 1991, while natural gas productions totaled 4.5 million MCF. 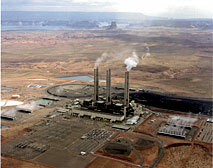 Coal, oil, and uranium have been the foundation of the Navajo economy since the 1920’s. Leases for mineral and petroleum exploration or extraction currently total 400,000 acres, or about 2.5 percent of the reservations land area. Mine-mouth coal generating stations in and around Navajo country provide a substantial percentage of electrical power to the American Southwest and southern California. The Nation’s oil and gas severance is four percent of the value of the minerals extracted from reservation lands, and a three percent possessory interest tax is levies on the value of natural resource leaseholds. Energy and natural resource revenues, including earnings from forest products and agricultural enterprises, are expected to remain major contributors to the Navajo economy even as it diversifies. The Navajo Nation practices environmentally protection in the prudent development of its mineral resources.